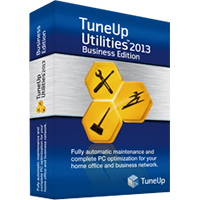 TuneUp Utilities 2013 is a collection of tools for cleaning up, optimising, repairing, customising, and generally getting the maximum possible performance from your PC. The program's core features may seem reasonably familiar. You get tools to clean and defragment your Registry, for instance. It can free up valuable disk space by finding and deleting leftover files. And there are modules to control your Startup programs, remove browser history data, defragment your hard drive and more. But what's different here is the attention to detail. When it comes to hard drive cleaning, for instance, TuneUp Utilities 2013 doesn't just delete your Recycle Bin and Temporary File folders. The New TuneUp Disk Cleaner 2013 cleans logs, caches and histories from 28 areas of Windows and more than 150 popular applications, and in the process effortlessly outpaced CCleaner on our test PC (it found 740MB to remove, TuneUp Disk Cleaner located 1.2GB plus 8.6GB of restore points). It's a similar story when clearing your browser tracks. While other maintenance tools just wipe your history or temporary files, the new TuneUp Browser Cleaner 2013 goes to work on more than 60 areas in IE, Firefox, Chrome, Opera and Safari (some of which, like Flash cookies, even the browser may not clean). And this is just the start. Ask most PC cleanup tools to look at your Windows Startup programs, for example, and they'll just list them, leaving you to decide what to keep and what to remove. 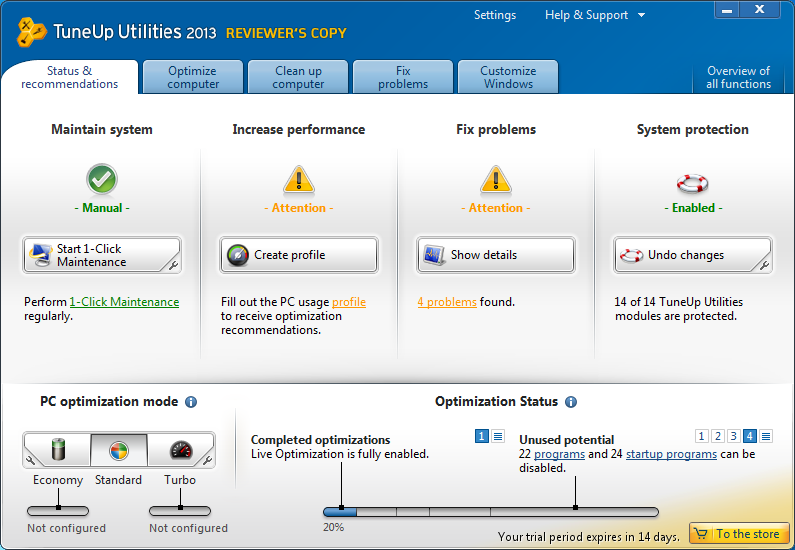 TuneUp Utilities 2013 will instead examine your current setup and make genuinely intelligent recommendations on how your PC's configuration can be improved: it's like having a Windows expert constantly on hand. There's also very real depth to the program, with valuable features and functionality everywhere you look. Like a faster, safer Registry editor, for instance, or a capable Task Manager replacement which also shows you which processes have files or internet connections open. And just in case that's not enough, this 2013 edition has been enhanced with more PC cleanup power. The TuneUp Disk Cleaner 2013 can wipe away leftover histories, logs and caches for Windows and many common applications. The Browser Cleaner 2013 protects your privacy by clearing all your activity traces in IE, Firefox, Chrome, Opera and Safari. TuneUp Live Optimization 2.0 is now better than ever at preventing resource-hungry programs from slowing everything else down. The Registry and Shortcut cleaner have also been enhanced for better results, and of course every element of the TuneUp Utilities 2013 is now fully Windows 8-compatible. Note that this is TuneUp Utilities 2013 Business Edition [5-PC] which contains a five PC license which you can use across multiple workstations or within your home office.